(Nanowerk News) A team of researchers has synthesized a highly active and durable class of electrocatalysts by exploiting the structural evolution of solid Pt-Ni bimetallic nanocrystals into porous cage-like structures or nanoframes ("Highly Crystalline Multimetallic Nanoframes with Three-Dimensional Electrocatalytic Surfaces"). This novel material significantly enhanced catalytic activity for the oxygen reduction reaction -- the splitting of an O2 molecule into two oxygen ions -- that is critical to fuel cells and potentially other electrochemical applications. 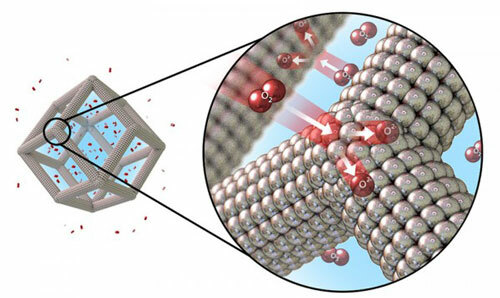 Illustration of the catalytic oxygen reduction reaction on the surface of platinum-nickel nanoframes with multilayered platinum skin structure. This approach to synthesizing the material is a significant advance towards realizing electrocatalysts with superior catalytic properties and lower cost. The open structure of the nanoframes addresses some of the major design criteria for advanced nanoscale electrocatalysts, namely, high surface-to-volume ratio, three-dimensional surface accessibility to reactants, and optimal precious metal use. Researchers are optimistic that the approach can be readily applied to other multimetallic catalysts, potentially lowering the cost of catalytic material production. Control of structure at the atomic level can precisely and effectively tune catalytic properties of materials, enabling enhancement of both activity and durability. A team of researchers from Argonne National Laboratory, Lawrence Berkeley National Laboratory, and the University of Wisconsin synthesized a highly active and durable class of electrocatalysts by exploiting the structural evolution of solid Pt-Ni bimetallic nanocrystals into porous cage-like structures or nanoframes. The material was synthesized by exploiting the structural evolution of platinum-nickel (Pt-Ni) bimetallic nanocrystals into cage-like structures with a self-assembled Pt skin structure on the interior and exterior surfaces. The starting material, crystalline PtNi3 nanoparticles, are transformed in solution and at mild temperatures into Pt3Ni nanoframes with surfaces that have three-dimensional molecular accessibility. The Pt-rich edges of the starting PtNi3 nanoparticles are maintained in the final Pt3Ni nanoframes. Both the interior and exterior surfaces of this open framework structure are composed of a Pt-rich skin structure that exhibits enhanced oxygen reduction reaction activity. The Pt3Ni nanoframe catalysts achieved a more than 36-fold and 22-fold enhancement in two different measures of catalytic activity (mass and specific activities, respectively) for the oxygen reduction reaction in comparison to state-of-the-art carbon-supported Pt catalysts (Pt/C) during prolonged exposure to reaction conditions. This work is a significant advance towards developing more efficient electrocatalysts for water-splitting reactions and fuel generation. These electrocatalyst structures were applied to the hydrogen evolution reaction (HER), which is the crucial cathodic reaction in water-alkali electrolyzers, which generate hydrogen by splitting water. The HER activity for highly crystalline Pt3Ni–Pt-skin nanoframe surface was enhanced by almost one order of magnitude relative to Pt/C. Utilizing the spontaneous structural evolution of a bimetallic nanoparticle from solid polyhedra to hollow nanoframes with controlled size, structure, and surface composition should be readily applicable to other multimetallic catalysts.